Contrary to classic baked beans, Plaki is served cold. Dried white beans are simmered in a tomato-based light sauce with carrots and garlic and finished off with fresh chopped herbs. Spread beans on a sheet pan and remove any stones and discolored pieces. Rinse well to remove dust and debris. Add beans into a large bowl and cover with twice their volume of cold water. Set aside on the counter, undisturbed, for 12-to-24 hours – you should have 8 1/2-to-9 cups of beans once soaked overnight. 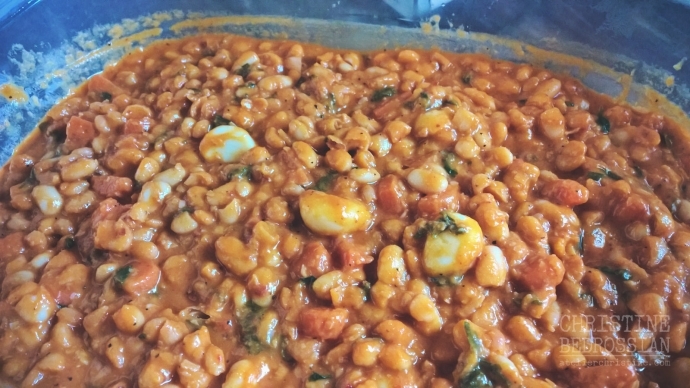 * I used Great Northern white beans for this post. 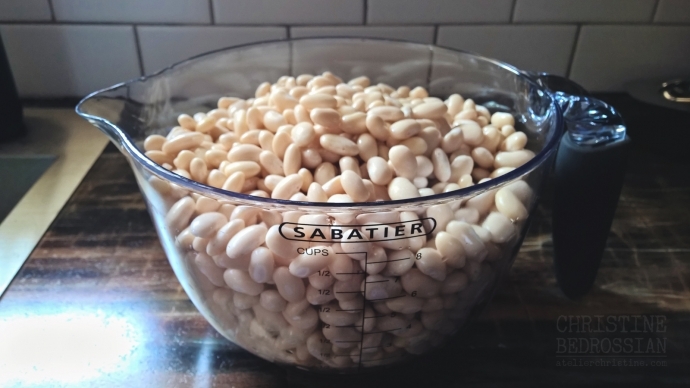 I also use Butter beans, Cannellini beans, Cranberry beans or large dried white Runner beans – just adjust cooking time at end depending on variety of white bean used. 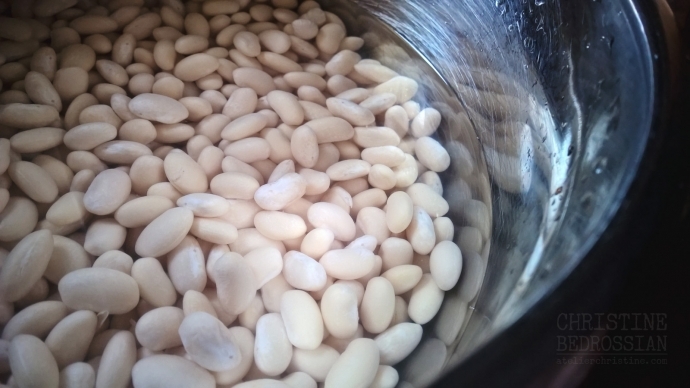 After soaking, transfer beans into a sieve and rinse thoroughly under cold running water. Add beans into a saucepan with 10 cups of water and a teaspoon of sugar. Bring to a boil over medium-heat, reduce heat to a gentle simmer and cook for 15-to-18 minutes, removing white foam with a spoon as it forms on the surface. Turn off heat, cover and once more set aside undisturbed for an hour. Drain parboiled beans and thoroughly wash in several changes of water until water runs clear and free of bubbles. Wipe clean saucepan used for beans. Stir-fry tomato and pepper pastes with sunflower oil for 3 minutes. Add 6 1/2-to-7 cups water, salt, black pepper, red pepper, salt and a teaspoon of sugar. Bring to a boil for 5 minutes. Add parboiled beans and bring tomato sauce to a boil once more. Reduce heat to medium-low, cover and cook for 40 minutes. Add carrots to saucepan, cover and cook for 15 minutes. Add garlic cloves and continue to cook, uncovered, for at least 25 minutes until sauce reduced and beans done to your liking. Turn off heat and check seasoning. Gently mix in olive oil and coarsely chopped herb. Serve chilled or at room temperature with pita bread or crusty rustic bread.